Louisville Mortgage Loans for FHA, VA, USDA and Rural Housing with KHC Down Payment Assistance. Government Shutdown Affects USDA Loans. Are FHA, VA, USDA Mortgage Loans Shutdown in Kentucky? via Government Shutdown Affects USDA Loans. Are FHA, VA, USDA Mortgage Loans Shutdown in Kentucky? The partial shutdown of the federal government is affecting some of the first mortgage programs through Kentucky Housing Corporation (KHC). KHC will not purchase or close a loan without the RHS Conditional Commitment and tax transcripts. KHC will require a VOE within 10 days prior to closing. The only exceptions will be conventional loans for military personnel who use their Leave and Earnings Statement (LES), or if their employment was validated by Desktop Underwriter (DU) service and follows all conditions. KHC will follow agency guidelines that are in place during the partial federal government shutdown. If federal tax transcripts or validation of social security numbers are required per underwriting, or are listed as an automated underwriting engines (AUS) finding within DU, then applicants will be required to provide copies prior to closing or purchase of a loan. If you have an existing interest-rate lock that will need an extension due to the partial federal government shutdown, please email your loan officer at the KHC lender handling your loan. Kentucky Homebuyer Loan Options for 2019.
via Kentucky Homebuyer Loan Options for 2019. What is a Kentucky USDA Rural home loan? via What is a Kentucky USDA Rural home loan? If you meet income eligibility requirements and are looking to settle in a rural area, you might qualify for the KY USDA Rural Housing program. The program guarantees qualifying loans, reducing lenders’ risk and encouraging them to offer buyers 100% loans. That means Kentucky home buyers don’t have to put any money down, and even the “upfront fee” (a closing cost for this type of loan) can be rolled into the financing. Fico scores usually wanted for this program center around 620 range, with most lenders wanting a 640 score so they can obtain an automated approval through GUS. GUS stands for the Guaranteed Underwriting system, and it will dictate your max loan pre-approval based on your income, credit scores, debt to income ratio and assets. They also allow for a manual underwrite, which states that the max house payment ratios are set at 29% and 41% respectively of your income. They loan requires no down payment, and the current mortgage insurance is 1% upfront, called a funding fee, and .35% annually for the monthly mi payment. Since they recently reduced their mi requirements, USDA is one of the best options out there for home buyers looking to buy in an rural area. A rural area typically will be any area outside the major cities of Louisville, Lexington, Paducah, Bowling Green, Richmond, Frankfort, and parts of Northern Kentucky . There is a map link below to see the qualifying areas. There is also a max household income limits with most cutoff starting at $76,000 for a family of four, and up to $98,000 for a family of five or more. USDA requires 3 years removed from bankruptcy and foreclosure. There is no max USDA loan limit. I can answer your questions and usually get you pre-approved the same day. Call or Text me at 502-905-3708 with your mortgage questions. How Much Debt Do You Currently Have? It only makes sense that the more debt you have the riskier the loan is for the lender. There is a finite amount of income in all of our households and it all gets allocated every month. Lenders use a “debt-to-income” ratio to determine how qualified you are for the loan based on how much debt you already have. 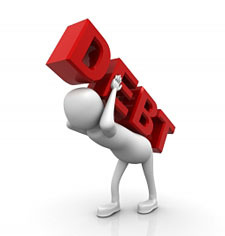 Your Debt to Income Ratio (DTI) is the percentage of your incomethat you owe in debt on a monthly basis. For example, if you make $5,000 per month, and have debt payments (car loans, credit cards, student loans, etc.) of $2,000, your DTI ratio is 40%. The higher this ratio is, the less likely you will be to qualify for a low interest rate. Conventional loans typically have a qualifying ratio of 28/36. FHA loans will sometimes allow for a higher debt load of 29/41 qualifying ratio. The first number in a qualifying ratio is the maximum percentage of your gross monthly income that can be applied to your mortgage. That includes the loan principal and interest, private mortgage insurance, property taxes, homeowners insurance, and homeowner’s association dues. The second number is the maximum percentage of your gross monthly income that can be applied to housing expenses and recurring debt. Recurring debt includes monthly payments for cars, boats, motorcycles, child support payments and monthly credit card payments. Gross monthly income of $5,000 x .28 = $1400 can be applied to housing. Gross monthly income of $5,000 x .29 = $1,450 can be applied to housing. If you are an individual with disabilities who needs accommodation, or you are having difficulty using our website to apply for a loan, please contact us at 502-905-3708. — Some products and services may not be available in all states. Credit and collateral are subject to approval. Terms and conditions apply. This is not a commitment to lend. Programs, rates, terms and conditions are subject to change without notice. The content in this marketing advertisement has not been approved, reviewed, sponsored or endorsed by any department or government agency. Rates are subject to change and are subject to borrower(s) qualification. The U.S. Department of Agriculture mortgage program is for Kentucky homebuyers that have no money to put down, have a stable 2 year job history, no bankruptcies or foreclosures in last 3 years and the new house payment should be close to or not more than 1/3 of your gross monthly income, this is called effective income. There is also a test for compliance income meaning cannot make more than a certain amount to use the USDA loan program in Kentucky. Most Kentucky counties are limited to $82k for a household of four, and up to $109k household income for a family of five or more. Thy used an automated underwriting system called GUS to pre-approved Kentucky home Buyers. If your score, middle credit score of the three main bureaus of experian, equifax, and transunion is below 640, you will automatically get downgraded to a refer and it will make it more difficult to get approved for the USDA loan. You don’t have to be a Kentucky first time home buyer people with low to moderate incomes who want to buy a home in an eligible area. They typically don’t want you to own another piece of real estate and if you have access to 20% down payment they will not let you use the program. This program is not intended for working farms, so if the property has farm income, i.e. crops, cattle, livestock, or other income this will not work for USDA loan programs. They will do loans on mobile homes that meet FHA standards and that are brand new. They will not finance a used mobile home. To get a Kentucky USDA loan, you work with a bank or other lender. The loan is backed by the USDA. You must be within certain income requirements — which depend on your area — and agree to use the home solely as a primary residence. Like Kentucky FHA loans , Kentucky Rural Development USDA mortgages have fees. There is an upfront guarantee fee, which can be as much as 1.0percent of the principal loan amount, which is added to your loan. You also will have to pay a mortgage insurance fee which is .35% and this is called the annual fee. This is way cheaper than mortgage insurance premiums of 1.75% and .85% for the same comparison. I you have questions about qualifying as first time home buyer in Kentucky for a Rural Housing or USDA loan , please call, text, email or fill out free prequalification below for your next mortgage loan pre-approval. Getting a Mortgage loan in Kentucky again after A Chapter 7 or Chapter 13 Bankruptcy. Getting a Mortgage Again in Kentucky after a Bankruptcy. Guidelines for FHA, VA, USDA AND CONVENTIONAL LOAN PROGRAMS. How long do I have to wait to get a mortgage after my Chapter 7 Bankruptcy? While different programs have different waiting periods, we offers some mortgage options as soon as 2 years after a Chapter 7 Bankruptcy for some Portfolio loans and 2 years from discharge for some government loan programs like FHA, VA, and USDA. What type of loans are available for a Kentucky mortgage after Chapter 7 Bankruptcy? We offer a wide variety of loan programs specifically tailored to Chapter 7 Bankruptcy borrowers in all kinds of financial situations: conventional loans, Kentucky VA home loans, FHA loans, USDA loans, ! While you may not qualify immediately for all the programs we offer, we will present the best available options, with the best terms, and lowest possible bottom line to you. We customize your options based on your personal goals. How long after bankruptcy can I get a Kentucky mortgage as one year into their plan. What types of Kentucky mortgages are available for clients with a Chapter 13 Bankruptcy? What is your waiting period for an Kentucky FHA Loan after bankruptcy? We are able to secure our Kentucky clients with a FHA loan or USDA loan 12 months after being in the plan for 1 year with a perfect pay history from Chapter 13 Bankruptcy. How long does it take to refinance after Chapter 13 Bankruptcy discharge? Mortgages after Chapter 13 Bankruptcy can take as little as 30 days to as long as 3 months. We pride ourselves on great communication and efficient service. The most common issues that slow the process down deal with credit, title, property condition and how quickly we receive requested documentation from you. We love to help our customers clear up these issues and put them on a brighter path. How long does it take to purchase after Chapter 13 Bankruptcy discharge? Mortgages after Chapter 13 Bankruptcy can take as little as 25 days to as long as 2 months. We pride ourselves on great communication and efficient service. The most common issues that slow the process down are credit problems, problems with the property itself, and how quickly we receive requested documentation from you. We love to help our customers clear up these issues and put them more soundly on a brighter path. Can I purchase a home if I am still in my Chapter 13 Bankruptcy? Yes, you can! Purchasing a home during a Chapter 13 Bankruptcy Plan does have extra steps involved though. Your trustee must approve your purchase and you must make all of your first year’s payments on time into your plan before purchasing a home. There are other challenges of obtaining a mortgage during a Chapter 13 Bankruptcy, but we are skilled at presenting a clear plan for success. Can I refinance my mortgage with Peoples Bank if I am still in my Chapter 13 Bankruptcy? Yes, you can! Refinancing a home during Chapter 13 Bankruptcy does have extra steps involved though. Your trustee must approve your refinance and you must make your first year’s payments into your plan before refinancing your home. Many borrowers find that waiting until after the 3rd year of on time payments is best for refinances. Some borrowers have also tapped into the equity in their home getting a cash-out refinance to pay off their Chapter 13 Bankruptcy Plan early. We have experienced great success securing trustees’ approval, especially when the refinancing option saves our borrowers a considerable amount of money. How long does it take to get a mortgage if I am still in my Chapter 13 Bankruptcy Payment Plan? Can I get a cash-out with my refinance after my Chapter 13 Bankruptcy? Many clients choose to obtain a cash-out refinance after their Chapter 13 Bankruptcy. Often our clients have not been able to tap into equity in their home during bankruptcy to make home improvements or consolidate high interest rate debts. Our mortgage programs have different limits set on the amount you can take out relative to the value of your home. Don’t hesitate to call to discuss your options. As a mortgage lender after bankruptcy, does Peoples Bank offer any options if I own my home outright? We have options to obtain a mortgage if you own your home outright. Although the wording is unusual, these mortgages are treated like a cash-out refinance. Cash-out options are best after the 3rd year of your Chapter 13 Bankruptcy Plan or as soon as one day after discharge. Are there loan programs that do not require a large down payment if I had a Chapter 13 Bankruptcy? we offer low down-payment mortgages after bankruptcy. FHA loans after bankruptcy have low down-payment options and both VA loan programs and USDA loan programs have zero down-payment options after bankruptcy. Your Mortgage Consultant will go over these options with you and determine if you qualify for one of the programs. They will present the very best options for which you qualify. What credit score is required to obtain a mortgage after bankruptcy? We have options for mortgages after bankruptcy with credit scores of 560 and up. . Private MI or PMI for Kentucky Mortgage Loans? What is a Kentucky Mortgage Rate Lock? 2017 Welcome Home Program for Kentucky Home Buyers. First Time Tax Credit Extension? How Long Do I Have To Be Employed to Qualify for an Kentucky FHA Loan? Student Loans In Collections, What Can I Do to get Approved For A Kentucky Mortgage ? Credit Scores Needed To Qualify For A Kentucky Mortgage Loan Approval? 2019 Welcome Home Program for Kentucky Home Buyers. “Site” refers to this Internet web site ) and its related services. “You” or “User” refers to a registered user of this Site. “American Mortgage Solutions.” or “We” refers to American Mortgage Solutions..
American Mortgage Solutions. is not responsible for the privacy practices of the content of any other Web sites to which We link or to which We are linked. We encourage You to read the posted privacy statement whenever interacting with any web site. This area of the Site is for the benefit of Users. The private and shared Work Space areas of the Site help to facilitate communication and the exchange and sharing of information. The information contained in private work spaces shared between Users and American Mortgage Solutions. is not used for any purposes other than to facilitate communication and the exchange of information between the parties involved. If You register to use or provide services using American Mortgage Solutions., we may collect and store information that specifically identifies You or your account (“Personally Identifiable Information”). The required information may include your User ID, password, first name, last name, business name, address, city, state, zip/postal code, phone, fax, email and web site address. We may, in the future, include other optional requests for information from You, to help us to tailor the Site for You and deliver personalized information to You. American Mortgage Solutions. may conduct online user surveys to collect information about our Users preferences. These surveys are optional and if You choose to respond, your responses will be kept anonymous. Similarly, we offer contests to qualifying Users in which we ask for contact and demographic information such as name, email address and mailing address. The demographic information that American Mortgage Solutions. collects in the registration process and through online surveys may be used to help us improve our services to meet the needs and preferences of our Users. This may include targeting advertising to You about our services. Information we gather through a contest may also be disclosed to third parties as necessary for prize fulfillment and other aspects of any contest or similar offering. American Mortgage Solutions. constantly seeks to improve the quality of the services We provide and the User experience on the Site. We value your input and encourage You to help us expand and make improvements to the Site by providing Us with any thoughts or comments You might have regarding our services or the operation of the Site. You can submit any comments by contacting us. If You provide this information, we will only use it to acknowledge or respond to your comments. In certain circumstances, we may ask for your permission to post your comments in marketing or promotional materials. American Mortgage Solutions. and other parties not affiliated with us may collect Personally Identifiable Information about your online activities over time and across different websites when you use our website or the services offered on our website. Industry standards regarding how to handle “Do Not Track” requests from web browsers are still evolving and there is currently no set of industry standards for handling such requests. As such we may not separately respond to or take any action with respect to a “do not track” configuration set in your internet browser. At this time, we do not have any protocol in place that allows you to opt-out of internet tracking. If you have any questions regarding our internet tracking methods please contact us.